Premier Rachel Notley says she will not fire Environment and Parks Minister Shannon Phillips over her mistaken claims the RCMP had at least two open investigations about harassment of supporters of the Bighorn provincial parks proposal. 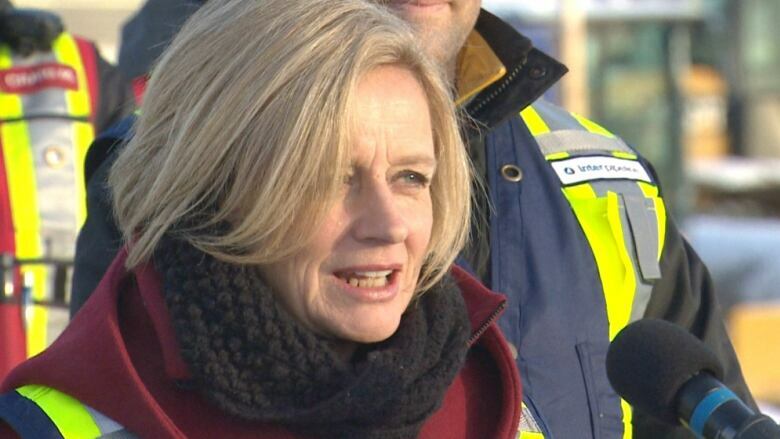 "I certainly will not," Notley said Thursday at a photo opportunity at the Inter Pipeline Heartland Petrochemical Complex near Fort Saskatchewan. "We have made tremendous progress in the last three years and that has happened as a result of the determined, informed, intelligent leadership of the minister who has my complete support." Just before Notley's media availability Thursday, United Conservative Party justice critic Mike Ellis issued a news release demanding that Phillips resign for lying to the public. "The minister has shattered any trust that remained between herself and those most affected by her Bighorn plan," Ellis said in his news release. "It's clear that the minister can no longer effectively perform her duties. "The minister should resign. And if she refuses to, the premier should remove her." Hours later, Alberta Party leader Stephen Mandel added his voice to the calls for Phillips to resign. "While intimidation and harassment are not acceptable, misleading the public as to the level of threat and the involvement of the RCMP affects the credibility of Ms. Phillips as a cabinet minister," Mandel said in a news release. "She no longer has the confidence of the Alberta Party to be able to execute the duties attached to her role and as such she must resign immediately." Phillips cited RCMP advice on the weekend when she cancelled open houses on the Bighorn proposal, which would create three provincial parks, a wildland park and four provincial recreation areas in the eastern slopes of the Rocky Mountains west of Nordegg. The RCMP said it did not provide any such guidance. Phillips said supporters were facing harassment, bullying and intimidation. In a telephone news conference with reporters Wednesday, Phillips said there were at least two open RCMP investigations. The RCMP said that wasn't the case. Hours later, Phillips said she "misspoke." The government is holding telephone town halls over the next two weeks to replace the cancelled open houses. If the government is assured public safety can be restored, Phillips says the open houses may be rescheduled.